What is played on your wedding day must be tender, sweet, and memorable, since people so often associate music with a particular event. 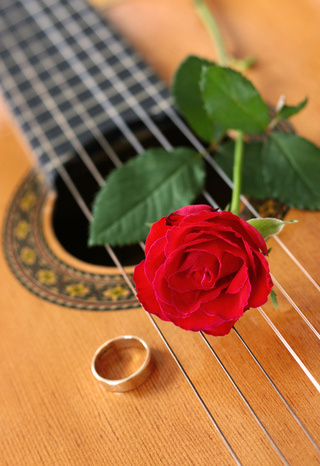 I want you to be able to look back and remember this enchanting day in your life accompanied by romantic guitar music. I play most of traditional wedding songs such as Canon in D or “Here Comes The Bride”, but not limited to that. Many of my clients prefer to choose their favorite songs or ask for my recommendations. Generally ceremonial music consists of Processional, Bride entrance and recessional. However some couples include an extra steps such as veil or sand ceremony, or a song performed by a friend or a family member. The prelude, for instance,is full of anticipation for the upcoming bride entrance. I start playing 15-30 minutes before the ceremony while your guests arrive and take their seats. The following processional should symbolize walking down the road to a new chapter in your life.The recessional will happily announce beginning of a new life for a newly married couple. I often continue playing during the cocktail hour or reception that immediately follows the ceremony, while now husband and wife are taking pictures and their guests enjoy aperitifs. Wedding guitarist and wedding music are an important part of your special day! Contact me from the contact page or call (949) 939-9060 for more information,rates and availability.